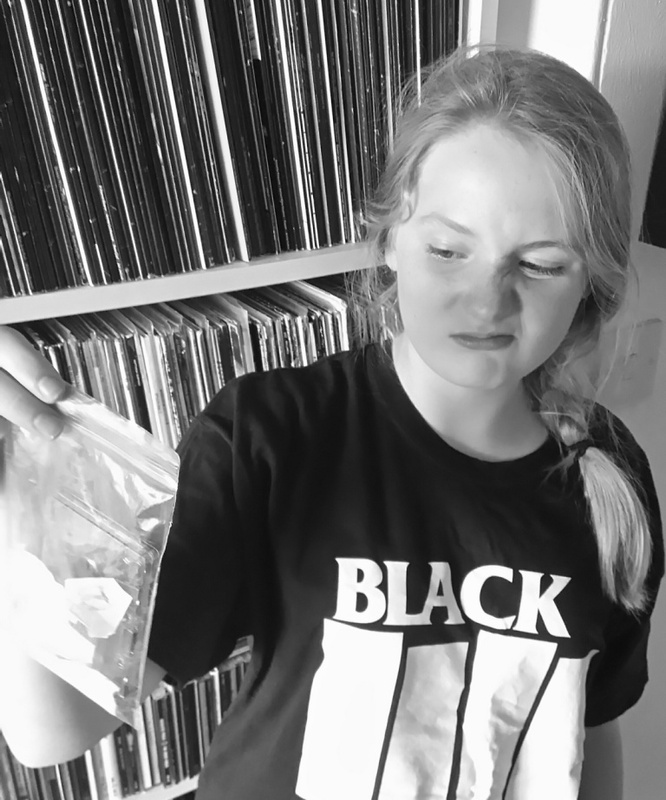 It’s the Summer Holidays [Editor’s note: well, it was when Joe submitted this article – such is the painstaking editorial process here at RFM] and the perfect way to avoid the blistering sun, thrashing hail or apocalyptic floods is to stay in and review tapes with the kids. This time Dulcie, our youngest, takes the helm and listens to two new mysterious Duplo Chat releases. It sounds like something trying to escape from inside a box, in the middle of the wind. It’s a croaky old machine, rusted up and about to malfunction. A tired robot tap-dancer is on their coffee break. The wooden spoon hits against the side of a porridge pot. It’s a person acting out ‘rain’, a broken wooden flute. Static on a TV with no signal. A deep voice booms from within a mask. It’s shovelling up snow and then scratching the spade against the concrete beneath or drawing with chalk a small pattern or jagged shape (bump not cobbled); a donkey pulls a cart full of apples. Errr… it’s like something that you’ve found in the bottom of a shopping trolley. It looks icky. What do I say? Startled guitar and dry tape noise in a dimebag. File under ‘skink-musik’. We use the same approach on this slightly longer tape that bears all the hallmarks of our Robert Ridley-Shackleton (but… fingers on lips, shhhhh). This time I hear a frog with a person in its throat… making cookies; a sad elephant crying about losing its family in the Metro Centre. Now it’s slowed down applause (from the 90’s), a phone turning on… an android heart-attack. This sounds like rewinding an old movie… a DVD glitching out. A clown squeezing their big, red nose or Darth Vader whinging. What do you think of the zine Dulcie? Oh great… orange is my favourite colour. It looks like teabags have been pushed onto a glass table and you’re looking at them from underneath. What do I say? She’s damn right and on the money! 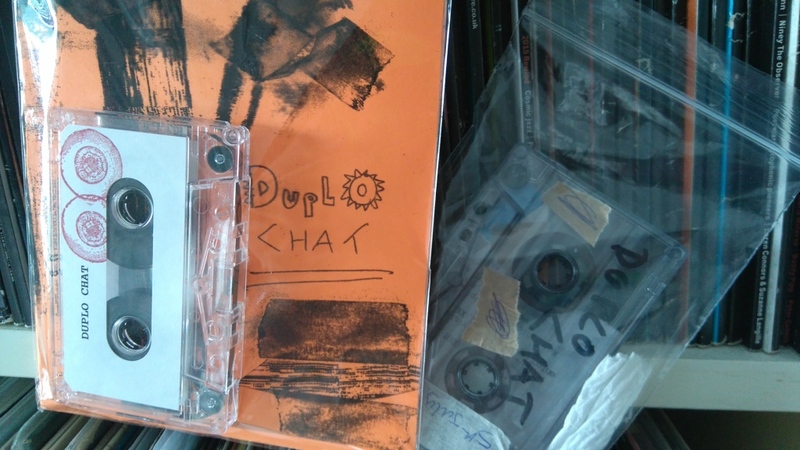 A delicious DIY release from the heart of rural England and the mind of the mighty Kek-W. Sounds like a falling star, sleeping sparkles just keep coming and form rainbow rain. // A pet band! The cat’s on the fiddle and the dog’s on the drums. // Electro Adams Family but scary …something weird is going on. I hear chanting. // Bassy beatz are suspenseful with tiny wailing, or sucking spit through your teeth. // A happy bee goes to work on the train. // Chugging pins. // Space disaster movie with slow trombones. // Wrenching open a bag of manure. // A dying bag of rocks. 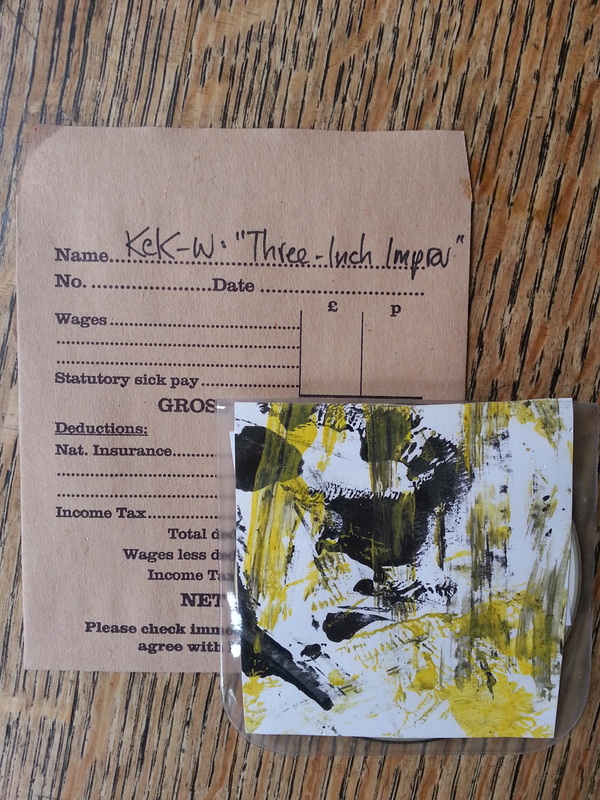 This tasty disc comes in an old-fashioned wage-packet including yellow n’ black micro-art piece, an homage to Stryper? 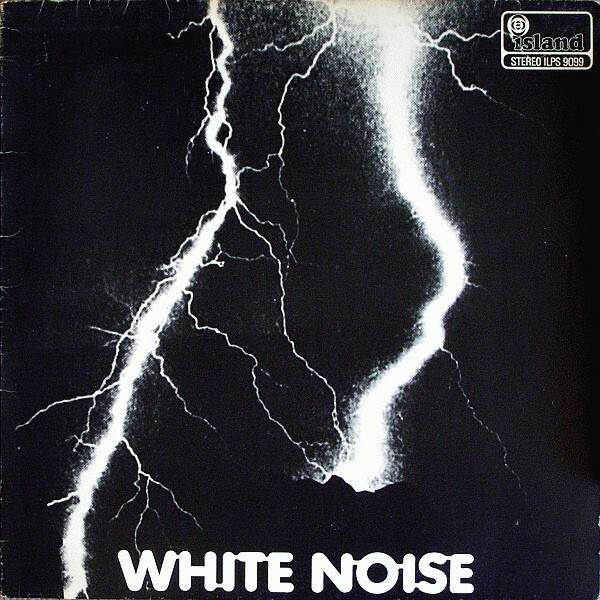 The 1968 album An Electric Storm by White Noise is a sound classic, inspiring avant garde/experimental pop bands such as Silver Apples and Stereolab who aimed to approximate the primitive, vestigial sound experiments curated by American electronic engineer David Vorhaus. Having attended a lecture given by Delia Derbyshire, Vorhaus joined forces with her and fellow Radiophonic Workshop composer Brian Hodgson and the result of locking themselves away together is this classic psychedelic pop album. An Electric Storm is playful and cinematic, filled with altered samples and tape spliced salads of circus melodies, special effects, French dialogue, sexual exploits, and screams of hell. 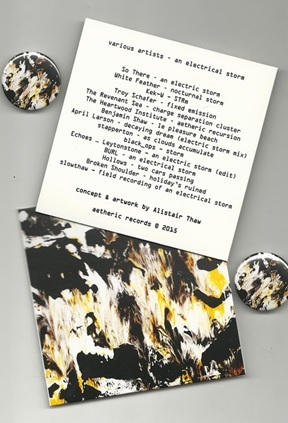 The aetheric records 2015 compilation, an electrical storm is a ‘tribute to the experimental spirit’ of White Noise’s masterpiece. All artists were given a field recording of an electrical storm made by aetheric records’ Alistair Thaw (a.k.a slowthaw.) They could use the track as they wished to create their own compositions. One could reason that conceptually inspired by the White Noise album, this compilation is a celebration of the technique: repurposing sound or ‘tape splicing’. And it isn’t just a bunch of musicians using the sample in similar ways or even using similar procedures. Each track has its own flavour and approach to the initial recording, resulting in a true tribute to ‘how-and-why’ the White Noise album was born. With a collection of international musicians rolling the dice with the storm, the result is an enjoyable and dramatic film journey accompanied by an unconscious familiarity with the source material. The tracks are well ordered, leaving the listener enjoying the rain. The compilation opens with So There’s xylophones and nuanced, quiet beckonings. White Feather’s Nocturnal Storm leads us into the glowing, pretty space where the listener opens their eyes refreshed. Kek-W‘s STRm walks us on to the train tracks into a dance party, climbing past metal riveters and pulsations. Troy Schafer’s fixed emission makes me seriously homesick for shows back in the States in sweaty spaces filled with unexpected distorted shouts and dark human stimuli. The Revenant Sea’s charge separation cluster is the static that makes the baby hair on arms stand at attention, possibly receiving transmissions from the galaxy. The Heartwood Institute’s aetheric recursion did not remind me of the massage school with the same namesake in Northern California. Rather it reminded me of the The Repo Man soundtrack [Editor’s note: high praise indeed! ], the listener being pursued by chain smoking UFO hunters. 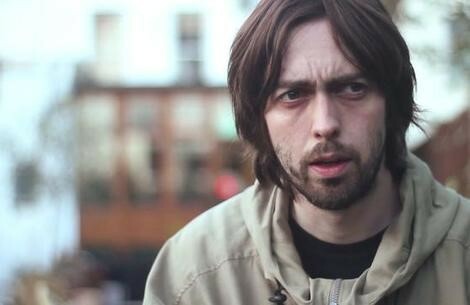 le pleasure beach by Benjamin Shaw washes one with watery ascending piano ripples. 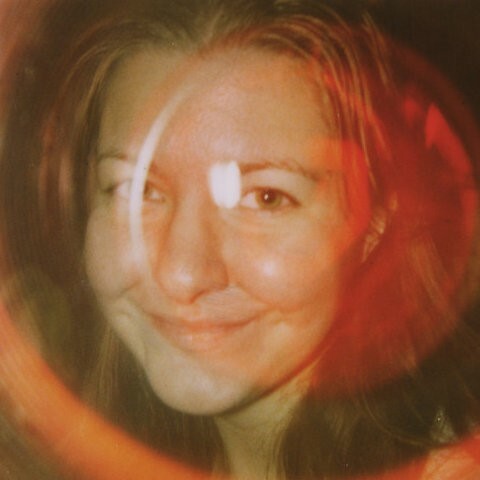 April Larson’s decaying dream (electric storm mix) delivers yet another cinematic track, this time with escalating David Lynch eerie suspense. as clouds accumulate by stapperton bounces a rubber ball intermittently walking through rain storms and swarms of whispering cicadas, inducing ketamine flashbacks. 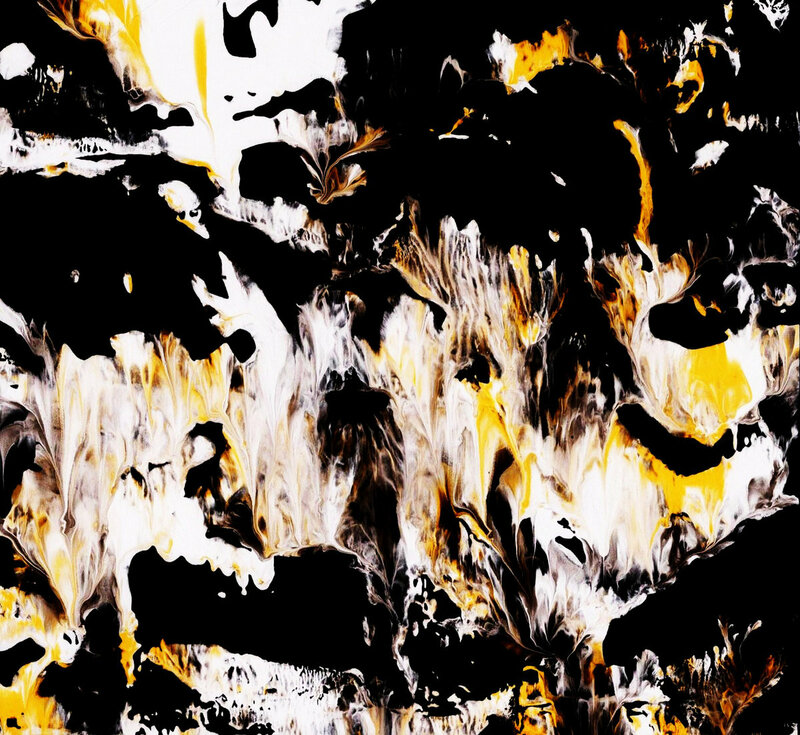 black_ops pushes one through a monochromatic static void, repetitive waves of great gravity surround. Echoes …. Leytonstone concretizes one’s senses again putting them into order with shushing reassurance to move through the gap. BURL attaches you to the outer space debris floating through ancient unknown civilizations, all being swallowed slowly into a black hole. One enters another dimension on a single sound. two cars passing by Hollows is a misty-eyed moment of mortality, organs and piano keyboards reminding us that we all grow old. Broken Shoulder’s holiday’s ruined is honing in on almost nautical transmissions and resonance, the ship is brought into port after a long voyage. Coming back to the source, and nature, with the clean, sharp field recording made by slowthaw. The compilation comes with a badge with the same disturbing, beautiful album art. I recommend listening to an electrical storm late at night with a jug of red wine, lying on a Persian rug and duvet for emotional comfort.